Abrasives are materials used to wear down, smooth, clean, shape, or polish a surface. The perfectly smooth surfaces needed in telescope mirrors, for example, are produced by grinding a piece of glass or metal with abrasives. One of the most familiar abrasives is sandpaper, heavy paper coated with a thin layer of aluminum oxide or silicon carbide. Sandpaper can be made in many grades, from coarse to very fine. The grade of sandpaper depends on the size of abrasive particles it contains. Abrasives can be either natural or synthetic materials. Until the twentieth century, humans used naturally occurring materials, such as sandstone, quartz, emery, corundum, diamonds, and garnet, as abrasives. Then, in 1891, American inventor Edward G. Acheson (1856–1931) produced silicon carbide by heating a mixture of clay and coke. For 50 years, silicon carbide (also known as Carborundum™) was the second-hardest substance known, after diamond. This property made it popular as an abrasive. Other synthetic compounds, such as aluminum oxide, boron carbide, and boron nitride are also used now as abrasives. A material can serve as an abrasive as long as it is harder than the material on which it is to be used. Diamond is the best abrasive of all because it is harder than all other substances. A measure of a material's hardness is the Mohs scale. This 0-to-10 scale was named after the German mineralogist who invented it in 1822, Friedrich Mohs (1773–1839). Any object listed on the Mohs scale can be used as an abrasive for any other object with a lower number. Aluminum oxide is a popular abrasive because it has a Mohs hardness of 9, higher than most other natural or synthetic objects. 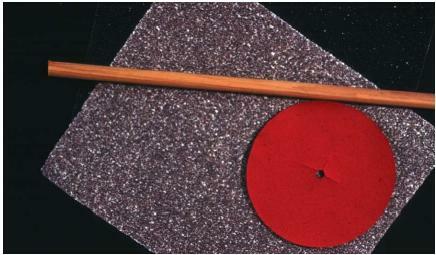 Industry uses abrasives in three basic forms. They can be bonded to a material to form solid tools such as grinding wheels, cylinders, rings, cups, segments, or sticks. They can be attached to paper, cloth, plastic, or other material, as is done with sandpaper. Or they may be used in a loose form, as when a spray of sand is used to clean the surface of a building during sandblasting. from the surface of an object. One example is the use of grinding wheels to smooth off the surface of a metal. Shaping is the process by which an abrasive is used to produce a desired shape. Sharpening a tool is an example of shaping. Sizing is a kind of polishing in which an abrasive wears away a surface until it assumes some exact shape. Cutting is the separation of a material into two separate pieces, as when a diamond saw is used to cut through a piece of metal. Pl. let me know the hardness of sandpaper on the MOH scale of hardness. Thanks.